Combining a precision large-aperture optic with a full-featured GoTo mount, plus a suite of useful accessories, the iOptron Photron 200mm f/8 Ritchey-Chretien Catadioptric GoTo Telescope is a complete system ideally suited for visual observation or astrophotography. Mounting the superior optics of the RCT on a fully motorized equatorial mount allows users to accurately track objects for long periods of time without the field rotation that happens when using alt-azimuth mounts. Without the field rotation, long exposure times of several minutes can be used without star streaking or blurring. Added to the OTA, mount, and sturdy tripod, iOptron includes a precision electronic focuser, an eyepiece and diagonal, and a finderscope and bracket. Conceived, designed and built for entry-level to intermediate astrophotographers, the iEQ45 Pro GOTO Equatorial Mount with Tripod from iOptron is outfitted with precision motors, zero-backlash gears and a computer controller to provide an ideal platform for imaging. The mount has a dual dovetail saddle that fits both Losmandy and Vixen-style plates for mounting compatible OTAs, and with a maximum payload capacity of 45 lb, it can easily hold large telescopes, counterweights, and accessories. It features a motorized equatorial mount, Go2Nova 8407+ computer hand controller, a 2" stainless steel adjustable-height tripod, and an illuminated polar axis scope for faster alignment and set up. The mount has a built-in 32-channel GPS receiver that sends your location and time to the Go2Nova hand controller, so the telescope can be set up quickly. The included dark-field illuminated AccuAligning polar axis scope installs through the body of the mount for accurate initial manual alignment, and alignment verification and correction during observation and imaging sessions. The iEQ25 is built for precise tracking, as required during long-exposure astrophotography, with highly accurate stepper motors and the ability for you to program out the Periodic Error Correction (PEC) common to all worm gears. The dual-axis 1.8° stepper motor is controlled by the Go2Nova hand controller. This system has an internal database of 359,000+ celestial objects, with 60 user-defined objects to program yourself. The hand controller has updateable firmware through the built-in serial port. With nine slew speeds and automatic tracking capabilities, finding and keeping objects centered in the field of view is easy no matter if you're viewing the fast-moving Moon or much slower deep space subjects. 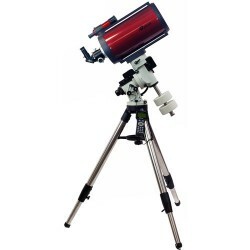 An adjustable-height stainless steel tripod is included for the mount and your telescope.